Rian Roop Lor Pra Sip Tat Crystal Wall of Ten Buddhas Amulet - Nuea Tong Daeng - Luang Por Ngern Wat Don Yai Horm (2433 - 2520 BE). The Baramee Sip Tat amulet was always a classic of Luang Por Ngern's Great Pantheon of Amulets, since he began to make amulets. The front face of the amulet depicts Ten Buddha Images within a five sided shape coin, five of them sitting in Samadhi, and five of them standing in various Mudra Postures. The rear face of the coin features the Sacred Yant Nam Tao Gourd yantra with a Buddha seated in the centre, and the Kata 'Na Mo Put Taa Ya' within the coils of the yantra. Below the Yantra are the words 'Luang Por Ngern Wat Don Yai Horm', and the date of the first edition coin 2512 BE. Luang Por Ngern had been making the Baramee Sip Tat amulet for many years throughout his ordained life, and many editions were made before the Year 2500 BE in Sacred Powders, But since the year 2500 BE, more than a decade passed without another edition. 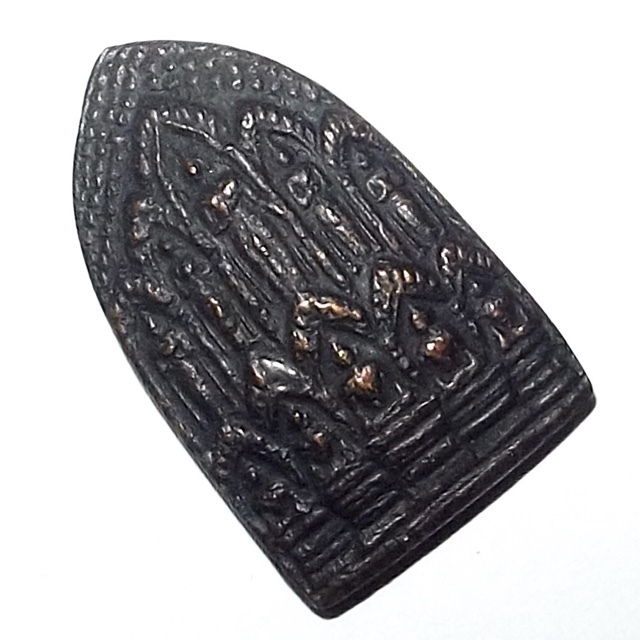 So in the year 2512, Luang Por Ngern, who saw that the temple had not released the Baramee Sip Tat amulet for a long time, and considered that in that time, the 'Bpam' type pressed metallic coin was highly favored in that time, and so decided he would make the first ever 'Rian Bpam Baramee Sip Tat' edition metallic coin version amulet. The Pra Baramee Sip tat 2512 BE coin was made in three different models; Pim Lek (small), Pim Klang (medium) and Pim Yai (large size). The amulets were made in numbers of 10,000 coins each. The Pim Lek and Pim Klang small and medium size version also differs in the fact that there are Bodhi Leaves falling on the top of the arch, and the Buddhas on the lower part of the coin, have their hands resting on the knees, instead of clasped together on the lap. Luang Por Ngern Jantasuwanno, of Wat Don Yai Horm (Official Ordained Name; Pra Racha Tammaporn), was known as the Taep Jao of Wat Don Yai Horm, and was extremely famous for his amulets, which are renowned for their Kong Grapan Chadtri, Klaew Klaad, Metta Maha Niyom, and Maha Lap Powers. Luang Por Ngern was the previous Abbot of the temple of Wat Don Yai Horm, before the Great Luang Por Chaem, who continued after him. He was a 'Pra Nak Pattana', which is the term given to a Monk who specialised in developing temples and Building Shrine Rooms, and local facilities for the common folk, such as schools and hospitals, to make merits helping living beings, to alleviate their sufferings. In the times of Luang Por Ngern, the temple of Wat Don Yai Horm and the surrounding area were still in the midst of undeveloped countryside, and the temple was the centre of gathering for the local folk. The temple of Wat Don Yai Horm was hence the place where the folk would go to be educated by the monks of the temple who performed the duty of teaching children and schooling them, as well as healing illnesses and ailments. Apart from this it was of course first and foremost the spiritual centre of the community, and the place where people received Dhamma teachings, and learned how to meditate, pray, and chant Kata. Luang Por Ngern was renowned for his meritorious attainments in both restoring and developing the temple facilities, providing education in the form of schooling for children, and medical treatment for the poor, and was a great source of comfort to those who came in desperation to seek spiritual consolation. This is the reason why he was called 'the Angel of Wat Don Yai Horm'. Luang Por Ngern was also extremely renowned for his high level of Patipatā (Practice of Restraint as an Ordained Bhikkhu within the 227 Rules of the Buddhist Vinaya Pitaka Canon), for his leadership in guiding the local devotees towards the right way to practice. He was just as well renowned and revered, for diligently and tirelessly developing the temple and its annexed facilities. He build many Public Buildings for the benefit of the Local Folk, in order to alleviate their sufferings. Even though Luang Por Ngern is long since passed on to the next world, the people of Nakorn Pathom province still pay respect and revere this Great Monk for his great Merits and Metta, and the selfless deeds he performed, and public facilities he built for the local folk, and his memory is as alive today, as it was during his lifetime. he is considered one of the great Guru Monks of History, and his amulets are amongst the most highly sought after. His vast pantheon of amulets range from highly preferrred Pra Niyom Monk and Buddha coins, Alchemical Maekapat Metal amulets, his famous Pra Sip Tat, Takrut, Putta Chinarat, Pra Sip Tat, Clay amulets (such as the Pra Tri Gaay, Pra Baramee Sip Tat, and Pra Putta Chinarat) and Sacred Powder amulets, especially his Pra Somdej are very favoured indeed.